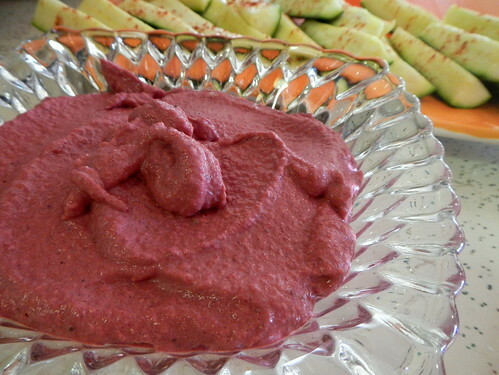 Beet Hummus. I KNOW, RIGHT? People are always complaining about people who share pictures of their food online. These people – the complainy ones – just don’t understand. Food is awesome. I want to see pictures of what you eat. And you want to see pictures of what I eat. Because the food I eat is interesting* and delicious and will make you beg for the recipe. This is one such recipe. But you need not beg, for I shall present it to you thusly. This recipe is one that I actually saw someone share on Instagram and I begged the recipe off her. I then adjusted it because my family can’t eat food like normal people. This is the version we enjoy. 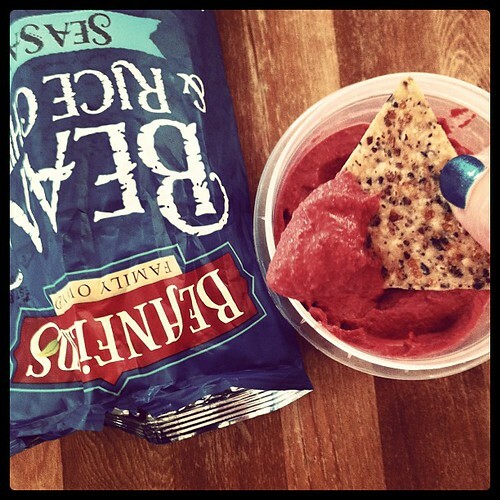 We like this as a dip, or on a sandwich. It’s good with crackers, chips, or veggies. I’ve had non-beet people try it and looooove it. I think the cumin helps to offset the beety-ness of the beets. Once I ran out of cumin and used a little bit of paprika and maybe a dash of my favorite smoked salt (but not a lot because my daughter is all anti-smoked salt). *Except for the food that is boring. But I don’t subject my online friends to photos of that.